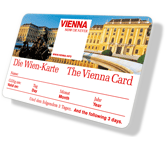 Our staff are available around the clock to help with bookings for various sightseeing tours and theatre tickets as well as table reservations and sales of the Vienna Card (travel ticket). Enjoy the local delicacies and specialities (Wiener Schnitzel, Tafelspitz, etc.) of the extremely varied Viennese cuisine and traditional Viennese café culture in the immediate vicinity of the hotel. Reception will be delighted to provide you with information about selected city tours and interesting guided tours through Vienna.